The easiest way to fight a house fire is to prevent it from occurring in the first place. So, when taking steps to prevent a house fire, it’s impossible to ignore the leading cause – cooking. 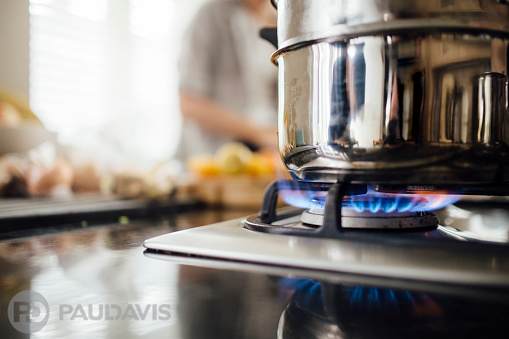 Every time you enter the kitchen to cook, it’s crucial to take measures to minimize your risk of fire and other accidents. Using common sense and knowing what key behaviours to avoid can make a far safer kitchen for you and your family. Let’s go through the basics of cooking fire prevention with this top 10 list, so you can stay safe while cooking at home. Keep your kitchen clean and organized. Minimize trips and falls in the kitchen and keep hazardous items away from counters that small children can reach. In addition, grease buildup is flammable. Make sure any spills are cleaned up regularly. Make sure equipment is in good condition. Frayed wires and faulty appliances can lead to kitchen fires. Have an extinguisher in or near the kitchen in case a fire occurs. Handy when you need them, but it is also important that you are properly trained and know how to use them. Know the difference between a grease fire and a regular fire. Pouring water on a grease fire will only spread the flames and make the situation worse. Grease fires need to be smothered. Keep a lid nearby to smother any fires before they get too large. Don’t leave cooking food unattended. Being vigilant and focused on cooking can minimize dangers that can occur if you get distracted. Be careful when using cooking oils and grease. It is easy to use these near open flames and create a fire that you can’t contain. Keep pot holders and dish towels away from the stove. These come in handy whenever you need to reach for a hot object, but they can also be combustible if they get too close to your cooking surface. Keep long sleeves tucked and hair pulled back. In addition to making sure that you keep towels and other flammable objects away from the cooking surface, you also want to make sure that your hair and clothing aren’t susceptible, too. Install a smoke detector near your kitchen. Having smoke detectors in place is a simple way to detect too much smoke and alert you to take action quickly. When a fire starts, the first few moments are critical. If a fire starts and you can’t contain it, quickly call 911 and get yourself and your family out of your home. After all, your home can be rebuilt. The safety of you and your family is the most important thing. Follow these steps and actively use caution when cooking to ensure that a kitchen fire doesn’t happen to you.